The FEU Lady Tamaraws are now in solo fourth after winning in 5 sets against the mighty NU in a grueling match 27-25, 25-17, 22-25, 26-28, 15-10 last March 19 at Philsports Arena in Pasig. FEU now has a 6-5 record while NU dropped to 5-6. Far Eastern University are now only 1 game behind to the University of the Philippines with a 6-4 record. On the second game , the University of Sto. Tomas can tie with the tamaraws if they will win the match against the defending champions Ateneo De Manila University. Head Coach Shaq Delos Santos revealed on his interview after the game that he was not surprised that the game last until 5 sets especially that NU is also trying to clinch a spot in final four. He also praise his players for their composure despite losing the 3rd and 4th set. Even though they won the first two sets, the momentum shift to NU where they won the next two sets. Jaja Santiago led the lady bulldogs to give confidence to her team mates. During the last set, it became more intense as the tamaraws made an adjustment and didn’t lost their focus to regain the momentum while Santiago did her best for the lady bulldogs but after an exciting match the tamaraws won the game. 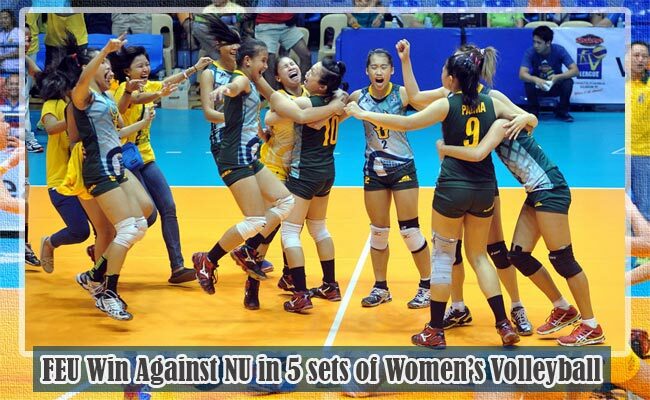 FEU outspiked NU with 75-51 and they had block scores 8-4. Meanwhile the lady bulldogs fought back through the errors of the tamaraws. Bernadeth Pons led the tamaraws with a game-high 30 points while her team mates Toni Rose Basas and Jerrili Malabanan helped with 21 and 20 points each. The team captain of FEU Mary Palma also contributed with 13 points. Meanwhile NU was led by Jaja Santiago with 28 points and their team captain Myla Pablo with 17 points in a losing effort.